The Count explains that with the aid of a wizard he has abandoned his dark legacy, and now finds himself in need of a legal representative. So he offers Brad a deal Brad can shuffle off into the light wherever it may lead, or he can become his lawyer, and be revived by a transfusion of Vampyre Blood. Impatiently, the Count presses for an answer to his offer, and after being assured that he will not become a Vampyre himself, Brad accepts, hoping to return and make sense of the madness that brought him to the brink of death. Populated by loveable rogues, scheming lawyers, and thieving gypsies, Vampyre Blood-Eight-Pints of Trouble is an insane romp through New Orleans, illustrating the intensity of our human desire to get what we want at any cost, and the strange places that desire can lead to. IMAGINE YOU’RE A VAMPYRE. Yes, with a y. You’re very good at what you do, but you’re tired of the Dusk-to-Dawn Life and you wish to give up your evil ways. So you time-travel 150 years into the future, join a Goth rock band, move to the USA, and begin a search for a lawyer to represent you as you defend yourself against persecution and the unconscionable inaccuracies found in Anne Rice’s blockbuster novel, Interview with the Vampire. How do you think such a journey would work out for you? George Earl Parker gives us just such a character in his hilarious send-up, VAMPYRE BLOOD Eight Pints of Trouble. In this highly entertaining novel, no less a personage than Count Dracula himself descends upon 21st century New Orleans and, while many in The Big Easy do not even notice such an anomalous individual on the street, his presence and, in particular, his quest for a virtuous attorney set in motion a preposterous but uproarious set of events involving a psychopathic prosecutor in the District Attorney’s office, a mysterious tailor, illegal Romanian refugees, a refined Mob boss with a taste for orchids and the classics, a wet-behind-the-ears newlywed law school graduate, a vulturous journalist and, of course, the internationally acclaimed music group, the Techno Zombies. No, it’s not for me, sir, he coughed, and anyway, the villagers will save me, they always do. It’s true, replied the Count. They appreciate your simple honesty, as do I. The farcical characters Drac encounters during his sojourn in another century, from the Zombies guitar player Shelley Byron to the Madame Defarge-type figure Momma Momar and villainous D.A. Richard Bleddon (get it? it’s a vampire story? ), affirm our suspicion that we are in the lively presence of Chauceresque satire. The plot’s vignettes, including an organized crime board meeting conducted in accordance with parliamentary procedure, a miraculous cure in a hospital operating room, a flawlessly planned and incredibly bungled hit and a bizarre knitting-needle attack by an old woman do likewise. Unexpectedly, once ensconced in New Orleans, Drac himself hovers on the edges of the story as the nutty characters affected, directly or not, by his arrival in their town romp all over one another in a tangled riot of criminal activity, cover-ups, miscues, magic, mayhem, and innocent misunderstandings, all of which eventually give Drac the opportunities he seeks to redeem his troublesome past forever. Right up to the denouement in a flour-coated pasta mill, complete with a very theatrical curtain call involving the entire cast, Parker has provided a laugh on every page. To dance is like knocking on the door to eternity. All of the spirits and angels love to dance, it’s the universal language of joy, and joy is the very heart of enlightenment. The seasons dance with time in an endless pas de deux. The ocean dances with the moon, the sun dances with the earth, and the stars dance with space. you gotta search through a lotta crap. Whatever Mr. Parker’s intentions for these passages, they ring true and do not feel in the least ironic. If no one has yet done so, perhaps Mr. Parker will do us the favor of actually setting to music and recording the lyrics he has incorporated into this otherwise light-hearted escapade, so that one day we may dance to them. VAMPYRE BLOOD is not literature, nor does it pretend to be. It contains a few malapropisms and capriciously placed commas, but they don’t matter. It’s a rockin’ fun story of a type sorely needed in our era of financial distress, unemployment, world terrorism, cynicism, and PC extremes. This is a book to read during a bumpy flight, to while away a long wait at the dentist’s office, or to carry with you to an IRS audit. If you are looking for a moody, spine-tingling vampire story you may be disappointed. But if you love a good lawyer joke, get tired of the pretenses we must endure in daily life, and want a respite from feeling bad about your little failures, you will love this book. Its humor will brighten any day and its perspective will lighten your heart. It’s silly, it’s endearing, it’s very human, and it will make you laugh out loud. A hearty Thank You to George Earl Parker for the opportunity to read and review this novel. Passages from the book are quoted with express written permission of the author, who is himself an artist and a country musician: http://www.georgeearlparker.com/ You will have to ask him yourself if he ever performs with the Techno Zombies, a real working band. This review reflects the tastes, perceptions, and opinions of one person only and may be entirely â€œwrongâ€ from another personâ€™s point of view. Please read the book yourself and decide. George Earl Parker is an author, singer/songwriter, and artist. As designer and director of the short film â€œYellow Submarine Sandwich,â€ included in Eric Idleâ€™s pseudo-documentary of a band called the Rutles, Parker received accolades, awards, and a showing at the Museum of Modern Art in New York City. His art has been exhibited in museums and galleries around the country, and three of his songs have shown up on the European Country Music Association charts. 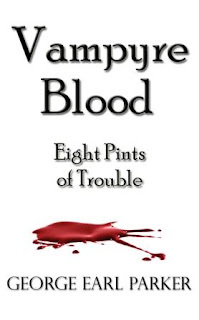 Vampyre Blood-Eight Pints of Trouble is his first novel. He currently lives in California where he is working on his music and his second book. You can visit his website at www.georgeearlparker.com.